Below you will find details of the many activities 'on land and sea' which are available in our area. Most of these - especially boat trips, which are dependent on the notoriously unpredictable Irish weather - cannot be arranged too far in advance. Katherine, our manager, will always advise and help you with bookings soon after you arrive. Rowing Boats:-We have 2 small rowing boats - one for use by visitors to Westcove House, The Stables and Garden Cottage, and another for tenants of Pier Cottage. Please Note! !...These boats are used entirely at your own risk. Due to strong undercurrents and unpredictable winds, they should never be taken out beyond the small sheltered harbour and please always wear the life jackets provided and make sure they are left tethered securely on you return - Michael will advise. 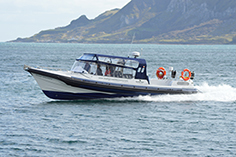 Angling and Boat Trips: As you will see, there are several very experienced and fully insured boatmen happy to take you on a variety of sea trips...most have informative websites - Katherine knows them all and will help you make the right choice! Derrynane Sea Sports: Located in one of the safest and most picturesque little harbours imaginable, Helen and her experienced young helpers offer a huge variety of sea sport activities for all ages during the summer months. All details on their excellent website! Riding: Caroline Donnelly, an extremely competent horsewoman, owns and runs the Eagle Rock Equestrian Centre. Turn left just before Caherdaniel, and you will find it a couple of hundred yards down the road on the right. Caroline and her team are fully insured and have horses and ponies for all shapes and sizes! Hard hats provided. As the best rides are along the Derrynane Dunes make sure you book in low tide ....A 'must' for riders of all ages and abilities! Walks: Kerry is a walker's paradise - from gentle strolls over sandy beaches to more challenging hikes over craggy hills - and our favourite local walks described here are ideal for dog owners, but please be sure to keep them well under control, especially on the hills where there are always sheep around. We suggest that the more serious walkers amongst you visit www.kerryway.com At 200km the Kerry Way is one of the longest - and certainly the most scenic signposted walking trails in Ireland. The 3 legs worth considering and easily walkable from Westcove are - 'Waterville-Caherdaniel', 'Caherdaniel-Staigue', and 'Staigue-Sneem' - details are on their 'trail description'. Sightseeing Trips: Kerry Experience Tours organise private day trips that show you the highlights of the southwest of Ireland, as well as the most beautiful places off the beaten track. Enjoy a private sightseeing experience that can be tailored to suit your wishes. Explore the Ring of Kerry, Dingle Peninsula, Beara Peninsula, Killarney National Park, Mizen Head, and much more. Let Kerry Experience Tours do the driving, so you can sit back, relax, and enjoy the most beautiful scenery, history, and culture. Blueberry Hill Farm (about a mile north of Sneem on the Killarney road) is truly family friendly. They offer an amazing variety of courses and activities for all ages, and the Family Fun Tour is a fantastic outing for children. John O’Shea (Tel: +353(0) 66 9475129 Mobile: +353 (0)87 689 8431) has a well equipped fishing boat and is happy to take groups of up to 10, deep sea fishing, but usually only in the evenings, from Derrynane Pier. He will sometimes come to Westcove Pier for longer trips by arrangement. John will take you all the way to Skellig Islands – (of 'Star Wars' fame ! )– a longer boat trip than from Port Magee, but much less driving. Ray Cushe (+353 (0) 877809286) is very flexible and can take any number for fishing/leisure trips in his own boat, based in Westcove harbour - (from €80 for 2 hours). Des O’Shea (+353 (0)872906229 or +353 (0)8723044270) will come to the pier at Westcove Harbour to take up to 12 of you on one of his adventurous boat trips around Kenmare and/or Derrynane bay....For details of his 1½ - 4 hour trips , visit his website - ribtrips.ie - and then ring him to discuss! John Fitzgerald (+353 (0)86 1062110) (from www.atlanticirishseaweed.com) does trips on his boat "The Red Monk" out from Derrynane harbour to the nearby islands. Click here for detailed information. Noel Donnelly (+353 (0)879474616) - sunfishexplorer.com - offers a variety of exciting, motorised Kayak trips for fishing and exploring the beautiful waterways near Sneem, 20 minutes drive away but well worth it! All ages catered for. Michael Casey (Katherine's husband) mobile +353 (0)876 312718 knows all the best spots for catching fish (mainly pollock and sea bass) off local rocks and beaches and will happily discuss it with you. For many years Lough Currane – a beautiful lake, 5 miles long and 2 miles wide, nestling in the hills behind Waterville - has been attracting anglers from all over Europe. Although the sea trout were in decline for a few years, the salmon farm off the coast, generally considered to have been the cause of the problem, ceased to exist a few years ago, so now the fishing on the lake, both for sea trout and salmon is taking off again with a vengeance. Dominic McGillicuddy (Tel: +353(0)66 9474023, mobile +353 (0)872051515) – is a real expert and will take you to the best spots himself – or he will hire you a boat for the day if you think you can manage without him. Take a picnic – there are some idyllic coves and islands where you can break for lunch. “Butlers Pool” is a narrow stretch of river linking the sea with Lough Currane. Keen salmon fishermen may like to try 3 hours on it, probably best after rain and at high tide … for availability and more information telephone (+353 (0)66 9474244 (Waterville House). Westcove, the perfect choice for your Kerry golfing holiday! Our 3 Westcove properties make an ideal base for friends or golf societies to combine an idyllic holiday with golf in the legendary 'Kingdom of Kerry'. Westcove House, The Stables and Garden Cottage can together sleep up to 15 in separate bedrooms (16 if 2 share a twin!)... and of course many more if there are couples in your group. Set off after a full Irish breakfast, play one of the great Kerry courses listed below and return to enjoy one of Katherine's delicious home-cooked dinners in the beautiful dining room at Westcove House . You can use your own cars or we can arrange a local mini bus for all your transport needs. Please note: Although we can only accept full week bookings during the summer months, short breaks (min 3 nights) are available the rest of the year. This challenging, immaculately maintained links course, only 10 miles (20 minutes drive) to the west, is played by many top pros to prepare for the British Open.... 'A must' for serious golfers. Green fees are high - about €230 at the time of writing - but reduced rates apply before 9am and after 4pm Monday to Friday. Well worth an early start anyway as you're likely to have a clearer, faster round! This 12 hole course on the estuary (3 miles beyond Sneem towards Kenmare) has to be one of the most stunningly beautiful short courses in the world! Take lots of old balls – they tend to plug in damp conditions and there is a lot of woodland and gorse. Every hole is very challenging – a really pretty walk for non-golfers too. No booking necessary, though it’s worth checking with the Parknasilla Hotel (064 6675600) to make sure you won’t clash with a society or competition – weekdays recommended when you can often have the course to yourselves. Green fees - very reasonable at €25 - €30 - (only €15 for 'under 16s') are usually payable at the small ‘clubhouse’ - if unmanned they can always be obtained at the reception in Parknasilla Hotel. This legendary hotel has an excellent bar and lunch menu, and a spa with fabulous facilities open to non residents. A relatively new 18 hole course, about 5 miles west of Kenmare, on the Sneem/Kenmare road – about 40 minutes drive. It is hilly, with fabulous panoramic views over the Kenmare Estuary. Reasonable green fees - ranging from €40 for 9 holes, €80 for 18 and €110 for 36. Take a buggy if you’re not a mountain goat! Our son and his young, fit friends really enjoy this course and find it an excellent contrast to Waterville, being parkland in character, but equally challenging, with a welcoming clubhouse serving drinks and bar food at the end! About 45 minutes drive, this is a pretty course on the right, just as you go out of Kenmare towards Cork. Originally a 9 hole course – there is now a second, (rather hilly !) 9. During the week it is often possible to play the first 9 only for €30 – useful if you want to combine golf with a shopping spree in Kenmare! (Otherwise green fees for 18 holes are about €55 - even at weekends). *Dooks Tel: +353 (0)66 9768205, www.Dooks.com – 1¼ hours drive, near Glenbeigh, on the Ring of Kerry - a classical, unspoilt links course with stunning views over the Dingle peninsular - a family favourite! The rolling dunes behind Derrynane Beach - about 15 minutes drive away - are a dog walkers paradise - see Local Area for directions - on the beach itself, dogs are supposed to be kept on leads, but this is only strictly necessary during the summer months - we certainly love watching our dogs bounding in and out of the sea at other times of year! Apart from strolling around Derrynane Bay as already described, there are a couple of excellent, slightly more challenging walks you can try, starting from Westcove itself. An ideal 1-1¼ hour walk we often do, is to follow 'Kerry Way' signs over the crossroads, up the road until just past a graveyard on the left. Turn left and follow this track straight over the hill, eventually coming down conveniently just by Freddy's pub...the lazy way of doing it is to be driven up to the graveyard by a 'non-walker' who can then meet you an hour later at one of the Caherdaniel pubs and drive you back - after some well deserved sustenance! For more serious 'hill' walkers, a lovely 2-2½ hour walk is to start off the same way but about ¼ mile after turning left past the graveyard, take a dog-leg right - this track takes you up to the top of the hill (only attempt it on a clear day) and then right down, to a road which eventually ends up alongside Loch Currane, near Waterville. for this option you definitely need to be picked up about 2¼ hours after you've started, somewhere along the continuation of the lake road. As you can imagine, there are magnificent views over the estuary and the Atlantic beyond all the way along both versions of this walk. John and Kerryann Fitzgerald have been running Seaweed Discovery Workshops, Walks and Tastings from their base in Caherdaniel since 2009; their shared love of nature and all things marine lead them to focus on seaweeds, which they have been harvesting, eating and experimenting with for years. Kerryann uses her culinary skills to create a range of delicious dishes from a series of hand harvested local seaweeds. Click on this link to see some ideas of what they could offer Westcove visitors. You can contact John direct on +353 (0)86 1062110, or email seaweedwalks@gmail.com. Vincent Hyland is one of Ireland's best known natural history personalities. He is a multi award winning natural history filmmaker, publisher, producer and director and has appeared on BBC, UTV including TV3, RTE and TG4. He has contributed to programs such as BBC's Coast, RTE's Living the Wildlife as well as having a segment on RTE's Nationwide about his wildlife illustrations and paintings. He is qualified in natural sciences is a fully licensed passenger boat skipper and emergency first responder. He is a 32 year scuba diving and underwater filmmaker expert. He has travelled extensively, filming in places such as Antarctica and Galapagos, Africa and along the Atlantic Shores of Ireland. He has made 5 films including Puffins of Skellig Michael - the first iBook textbook for ipads. His short films have been officially selected for screening at the North Sea, Seattle and San Francisco Irish reels film festivals. He lives in Caherdaniel with his partner and their three year old son. 1) Flowers of the forest and Sand dunes. A walk through Derrynane National Historic park followed by a looped walk around the Sanddunes. Flower identification, natural history of the formation of the dune system, geology of the area including a visit to the protected Natterjack toad ponds. 2 hours @ €150 per group. Own transport required, meeting at Derrynane House Car Park. A trip to some of the local rockpools to explore the animals inhabiting these shallow marine environments. This includes learning about how animals survive, what they eat, how to identify them and distinguishing their behaviour. Fishing with nets (provided). Each participant get the chance to catch animals and get their feet wet in this fun learning environment. 1½ hours @ €150 per group (weather and tide dependent). Own transport required, meeting at Derrynane House Car Park. A walk to the top of Coom, along the old bog road across the ridge to see the beautiful scenery and back along the Kerry way to Caherdaniel village. Walk includes talk about the local geological formations, the copper mines, the flora and fauna. 2½ hours @ €150 per group. Own transport required. Meet in the Caherdaniel village. Early morning from Westcove. Explore the inshore coves of Kenmare bay including Seal watching and possible Dolphin and Whale watching. See seabirds and possible exotic species such as sunfish close up. This trip involves the use of motorised Kayaks. Easy to use, a brief training and safety session (30 minutes) will be provided before departure. All safety equipment including life jackets and spray decks are provided. Light refreshments also provided. Guided by qualified Skipper and wildlife guide Vincent Hyland. A 1 hour snorkel along Abbey Island. Take in the underwater beauty of our temperate maritime shallow seas. This trip will open your eyes and senses to the beautiful clean underwater environment of Derrynane. Wetsuits and masks are provided. Duration 3 hours, €125 for a group of 5 persons, or €25 each. Own transport required. Meet at Derryanne Sea Sports.